Required update: earlier versions cannot find data updates at our new location. Enhanced portfolio view highlights bonds with unrecognized purchase dates or which are still in the mandatory holding period. Updated with pricing data through May, 2010. Trial download does not contain the latest pricing information. There's no cost to upgrade an existing license, so download today. Track all of your US Savings bonds, including EE Bonds, I Bonds, E Bonds, and Savings Notes. See current and historical (1992 to present) valuations and interest earned for bonds with issue dates back to 1941. Do you report your bond interest annually? Savings Bond Tracker automatically totals your gains by tax year for easy reporting. Are you letting your earnings grow tax-deferred? Savings Bond Tracker can show the cumulative earnings for your entire portfolio, year-over-year. Create different portfolios for each of your investment objectives. Want to crunch additional numbers in your spreadsheet? Export your portfolio to a Comma Separated Values (CSV) file for easy transfer to your spreadsheet software. 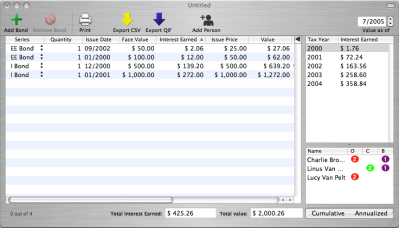 Export your portfolio to a QIF file and load it and all available pricing data into Quicken for Mac. What's more, you can do partial exports or just tell Quicken for Mac about the latest prices. Already entered your data on Windows? Savings Bond Tracker can import CSV files created by the US Treasury Department's Windows-only Savings Bond Wizard (R). No need to fire up VPC just to check on your bonds! 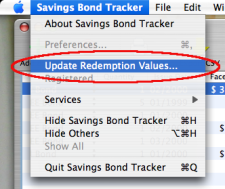 Your licensed copy of Savings Bond Tracker comes with free Internet updates for bond redemption values. Copyright Spotted Snake Software 2005-2015. All rights reserved. Mac and the Mac logo are trademarks of Apple, Inc., registered in the U.S. and other countries. Quicken for Mac is a trademark of Intuit Inc.